Focalpoint Repointing - Builder based in Birchington, Kent. Established in 2002, FocalPoint has gradually built a solid reputation, working on both residential properties and also as a sub-contractor on larger projects. We have carried out work for the English Heritage in Surrey and often work on listed buildings alongside local councils. We specialise in both traditional lime pointing and in the use of modern cement based mortar. A site visit will quickly determine the best type of mortar for your property. We have two highly skilled teams, which work both quickly and cleanly. We use the highest quality machines to ensure quick mortar removal with minimal amounts of dust or debris. All our machines are fitted with dust extraction units and depth plates to ensure a continuous depth of cut, the fundamental rule for a professional pointer. We maintain traditional repointing methods, relying on our operative’s expertise as opposed to pumps or guns. Pointing is carried out in the traditional hawk and trowel fashion allowing for all types of finish/strike to be applied. We put great emphasis on the finish of all our pointing styles, making sure that each style matches both the age and design of the building. We are happy to take on a wide range of projects, from garden walls to tower blocks. 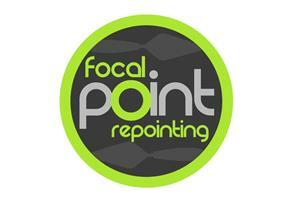 For any repointing needs you may have, please call FocalPoint for a quote or advise. If you have any projects that you would like us to look at, or you have a general enquiry about our services, please do not hesitate to contact us.